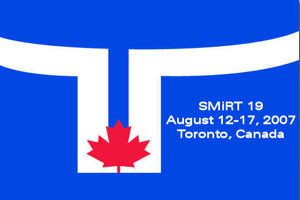 SMiRT 19 was held August 12-17, 2007 at The Fairmont Royal York in Toronto, Canada, following 18 successful biennial conferences in major cities around the world. It brought together scientists and engineers from around the world who deal with all aspects of structural mechanics applied to buildings and components in nuclear power plants and facilities. The technical program, composed of 13 divisions, featured plenary and keynote lectures, workshops, and presentations which provided comprehensive coverage of important topics and concepts designed to shape nuclear development in the future.